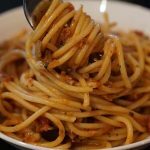 Easy quick and delicious this simple meal is perfect is something you'll be proud to feed your family! Place a large stock pot over medium heat. Add the butter and garlic - when hot and bubbly, add the chopped onions and mushrooms, season with salt, pepper and red pepper flakes. Sauté for 5-6 minutes until the vegetables are soft. Add the garlic and continue cooking for another minute or so. Increase the heat to medium high and add the red wine and scrape the bottom of the pan to remove all of the bits on the bottom, when most of the wine has cooked off add the jarred sauce and water. Bring to a boil and then reduce the heat to medium low and simmer uncovered for 20 minutes. While the spaghetti sauce is simmering - cook the pasta - add directly to the sauce pan when done and finish by topping with a bit of parmesan cheese if desired. Please note - if you are using additional add-ins - cook raw vegetables with the onions & mushrooms, during sautéing - if you are adding canned foods such as olives, sundries tomatoes or roasted red peppers, add them when you add the jarred sauce. Super simple & super good!